Trade wallet-to-wallet on a high performance, institution-grade, decentralized platform. More liquidity, lower fees, and less risk. We decentralize the most security-vital parts of an exchange, while preserving the speed and scalability of traditional order books. Execute trades efficiently and effectively. Our hybrid architecture decentralizes the most security-vital parts of an exchange, while preserving the speed and scalability of off-chain order books. Create an account, link your wallet, and you're ready to trade! 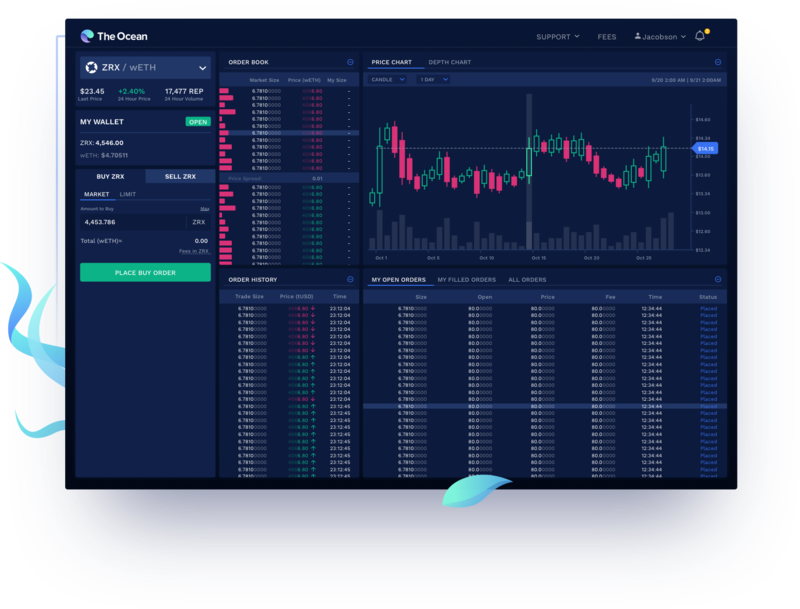 Enjoy an intuitive trading experience on both desktop and mobile. We're committed to market integrity, so we perform KYC/AML, review tokens, and police bad behabvior. That means fair and safe trading. Centralized exchanges cost you time and money. Trade with no withdrawal, deposit, or transfer fees —and OCEAN token holders pay even less. Our hybrid architecture decentralizes the most security-vital parts of the exchange, while perserving the speed and scalability of off-chain order books. Subscribe for company news, product updates, and the latest from The Ocean. The Ocean was founded by an American team of developers, traders, and investors.